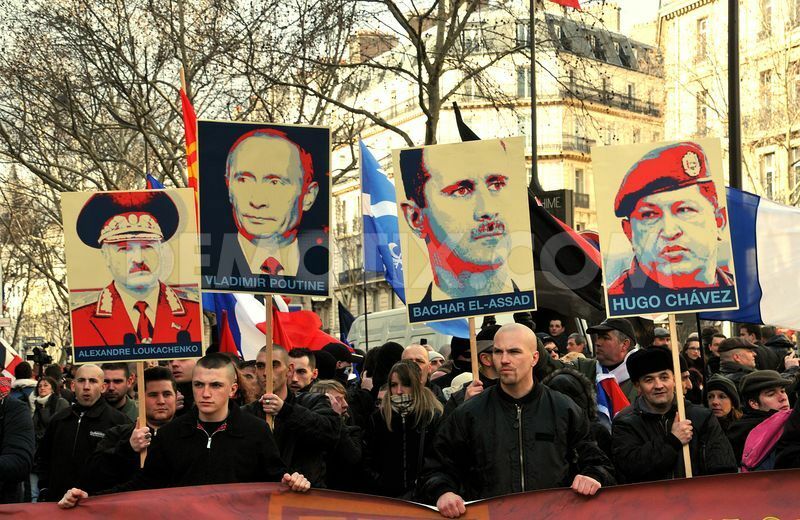 Syria’s bourgeois-democratic revolution and the need for boots on the ground. I share the following view by the Antiwar Committee in Solidarity with the Struggle for Selfdetermination but the important question is how can any decisions arising from the negotiations be enforced and maintained without a military force on the ground that is committed to enforcing and maintaining the transition. The question of ‘boots on the ground’ needs to be tackled pro-actively by the governments and the UN that established the opportunity presented by the coming negotiations. Boots on the ground that are sympathetic to the Syrian people would make delivery of humanitarian supplies more likely on the scale that is required. Apart from needing to protect Syrians from the likes of Daesh, a military coalition on the ground (and backed by air support) will be necessary to guarantee that people can vote freely and to protect the Assad loyalists among the Alawite community once he is tossed out. We support efforts by the High Negotiations Committee of the Syrian Opposition to negotiate a political settlement which will lead to a transitional governing body, and to human rights for all, rule of law, and democracy for Syria. Given the scale of documented atrocities carried out by the Assad regime, it follows that such a process must bring an end to regime rule. We further support the demand by the High Negotiations Committee that the international community implement in full the humanitarian provisions of UN Security Council Resolution 2254 prior to negotiations. The current Geneva III Conference has begun against a background of escalating Russian and regime bombardment of populated areas and civilian infrastructure, escalating starvation sieges, and ongoing mass detention and torture of political prisoners. UN Security Council Resolution 2254, which set out the international endorsement for these talks, called on the parties to “allow immediate, humanitarian assistance to reach all people in need, in particular in all besieged and hard-to-reach areas, release any arbitrarily detained persons, particularly women and children,” and demanded the full implementation of the long list of unenforced Security Council resolutions on Syria: 2139 (2014), 2165 (2014), 2191 (2014) and any other applicable resolutions. These items are the express will of the Security Council and as such are not for negotiation between parties. The international community should never preside over a process where humanitarian relief is allowed to be used as a card in political negotiation. As long as the international community fails to enforce its own resolutions, the Syrian people can have little faith in the peace process. If the international community can’t deliver baby milk to besieged areas, how can they be trusted to deliver free and fair elections? The Assad fascist regime is responsible for extreme human rights violations in Syria today. More than 220,000 people have been killed, 10 million people – half the country – have been forced from their homes, hundreds of thousands of political prisoners have been detained and 640,000 are living under brutal sieges without regular access to food, water or medicines. 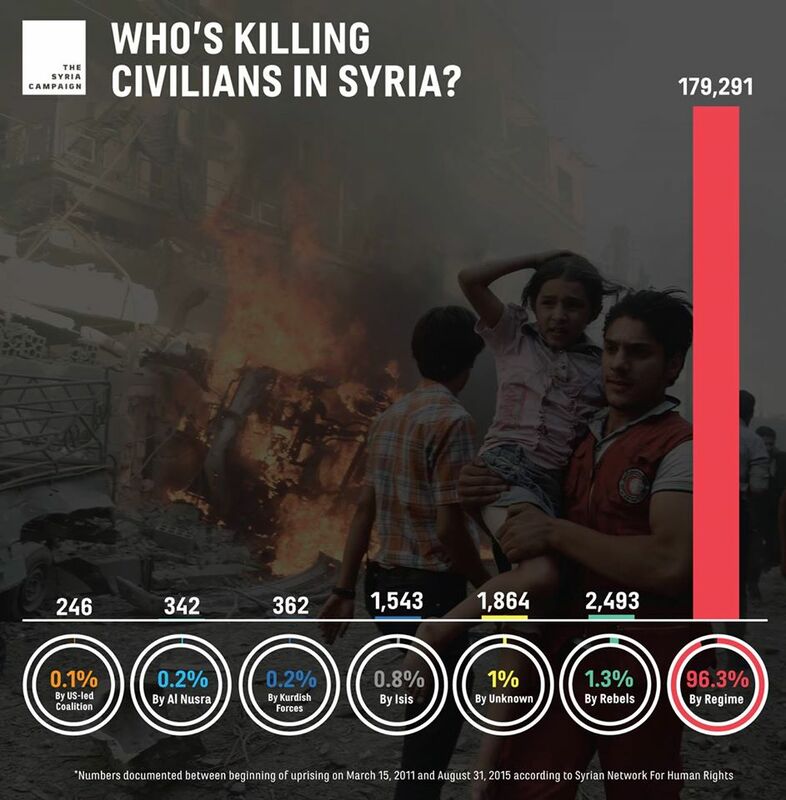 In September last year, the US-led coalition invaded Syrian airspace to bomb Daesh (ISIS) positions; yet a blind eye is turned when Assad’s aircraft bomb civilian populations and the revolutionary democrats from the same airspace, killing many more than Daesh. From Planet Syria: Two years ago on 21st August 2013 the world was focused on Syria after the government of Bashar al-Assad used Sarin on civilians in the worst chemical attack for a quarter of a century. (Since the Halabjah chemical attacks by the Saddam Hussein regime in 1988). It was a declared crime whose details and elements are well-known to everyone, whether they admitted it or not. They know the only party that does not lack the ability, the authority or the criminal will required to commit such a massacre, which is the Assad regime. They also fully aware that the regime has all the means of production, assembly and delivery of chemical weapons that were the tools of this this crime. They know the perpetrator by name, and also the names of the top regime officials who were involved with him. They know how he committed this crime and how he handed, with the utmost shamelessness, the murder weapon. Two years have passed since the crime of the century, but the perpetrator is still at large. The families of 1,507 victims killed are still looking around for an international response equivalent to the size of the crime committed against their loved ones. And yet not a single measure has been taken to prevent the repetition of this crime. Death stills looms large over the head of Syrians, armed with every means of killing, ranging from knives and cleavers to barrel bombs, Scud missiles and chemical weapons. The Syrian Network for Human Rights documented 125 regime breaches of UN Security Council resolution 2118 and 56 breaches of UNSC resolution 2209 which criminalizes the military use of chlorine gas. While we in the Syrian Coalition renew calls on the UN Security Council to shoulder its responsibilities in maintaining security and peace in Syria, and to take immediate action to stop the crimes against humanity and violations and to ensure that criminals are held accountable, we deplore the indifference of the international community which continues to deal with the blood of Syrians as a bargaining chip, a means to settle scores and exhaust opponents. Having paid heavily for the sake of achieving our goals, we Syrians are now fully aware that we have to fight this battle relying only on the resolve of rebel fighters. Indeed, unity, rejecting discord, commitment to the principles of the revolution are the only guarantee of victory and liberating Syria from the Assad regime and its thuggish repressive security apparatuses and of the establishment of democratic rule which is bases on pluralism, justice and the rule of law. We ask for Mercy for our fallen heroes, recovery for the wounded, and freedom for detainees. Long live Syria and its people, free and with honor.